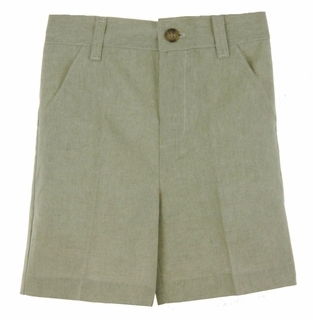 These classic oatmeal linen and cotton blend shorts are made by Glorimont, a leading manufacturer of children's clothing for more than 30 years. They feature a front fly with a tortoise button, side pockets, belt loops, and an elasticized back waist to ensure a good fit. Goes perfectly with Glorimont's white linen shirt shown below. Matching shortall is available for baby brother. See below.